It’s the day before classes begin. And, I’m very happy to have gotten most of my class prep for the semester out of the way earlier this month. The transition from Istanbul to Brooklyn was temporarily all consuming, along with other personal matters of a rather happy sort. Anyways, I’m not sure the future of this blog post-sabbatical, but today it seems useful once again. Here’s hoping in between classes and meetings there will be many more moments to obsess about coins. Back in March Nick Molinari pointed out to me the coin above and how it is a good parallel to RRC 2/1. That lead me to put a note about in my book manuscript. Yesterday, I came across the passage and found a marginalia by a helpful reader “explain or cut”. I realized I hadn’t really thought it through it myself. Here’s a link to images of the silver (see nos. 455-459) from Neapolis and an example of the Tarentine gold staters. The problem comes with trying to reconstruct what the heck Syracusan imagery is doing on the coinages of these two cities at this particular time. Our historical understanding of Agathocles policy is Southern Italy is severely hamstrung by the loss of Diodorus’ continuous narrative after 302 BC. Meister in the CAH VII part I, p. 405ff. does his best to reconstruct a narrative but its perhaps over full. He’s convinced that Agathocles is trying to build a series of alliances against Carthaginian power: “a carefully considered plan lay behind the Syracusan ruler’s Italian policy – he clearly aimed to consolidate the entire forces of the western Greek world under his hegemony for the planned new confrontation with Carthage” (p. 406). True? False? We just don’t have the sources to make this kind of claim. I suspect that Meister is too influenced in this by his belief in the so-called Philinus Treaty, in which Carthage promised to stay out of Italy and Rome out of Sicily c. 306 BC. These data points are really minimal. It’s probably not too much of a stretch to take the Tarentine gold staters as confirmation of the Tarentine/Agathocles relationship mentioned by Strabo. There are other examples of the Tarentine’s referring to their foreign allies on their coins, although these are invariably controversial in interpretation. It’s logical to slip the Neapolis coins in this same 300-294 BC window and hypothesize some sort of diplomatic arrangement between Neapolis and the Syracusan king. The silver has three different known initials on it suggesting perhaps issues over a number of years? [A die study would clear up that question.] Bronze types (that illustrated above and HN Italy 578) have naval imagery on them (trident and dolphin respectively) and we can notice that Agathocles seems particularly eager to control shipping lanes in the course of his Italic and concurrent campaigns. So perhaps we might speculate that the arrangement with Neapolis was related to some sort of naval agreement. As primarily a Romanist my real question is how does Rome particularly fit into this mess? My feeling is the RRC 2/1 is likely to have been engraved at Neapolis by the same engraver who did HN Italy 577 and 578 in roughly the same time frame. The rendering of the legends and the man-faced bull are the primary points of the overlap. And the absence of this profile man-faced bull otherwise on the Neapolis speaks for a tight chronology. So I’m going to go out on a limb here and say that the campaigns of Agathocles in Italy are some of our best dating evidence for RRC 2/1, c.300-294BC, given we have no available hoard evidence and only a single known specimen. Update 8 January 2015: Just ILL-ed Spadea, Roberto. “Crotone tra i Dionisi ed Agatocle.” pp. 107-120 in Krise und Wandel : Süditalien im 4. und 3. Jahrhundert v. Chr. : internationaler Kongress anlässlich des 65. Geburtstages von Dieter Mertens, hrsg. von Richard Neudecker. Wiesbaden : Reichert, 2011. 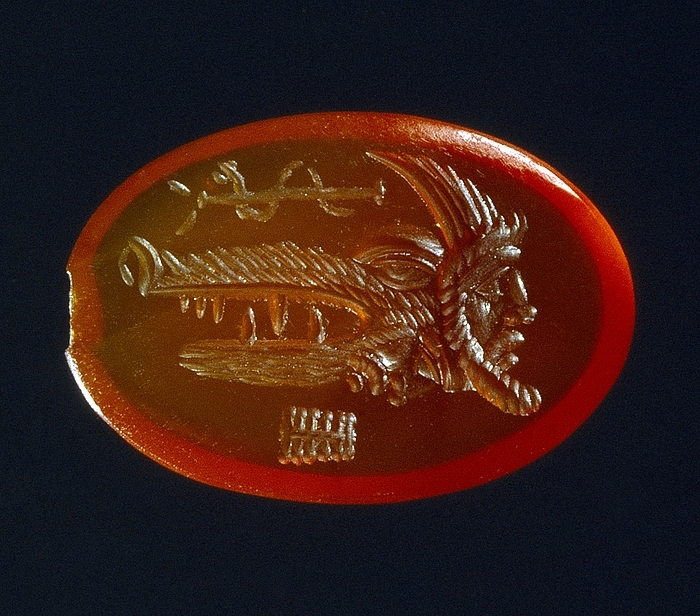 This uses hoard evidence from 2005 to look at Agathocles impact on Croton. Tangentially related but always good to see hoards being worked into the historical narrative. For a reconstruction of Agathocles’ Italian engagements that emphasizes tensions with Rome, see Decebal Nebu, “Agathocles and the Italic Powers at the Beginning of the 3rd Century B.C.” Revista Pontica 43 (2010): 37-50. A. Postumius A. f. Sp. n. Albinus. Denarius serratus 81, AR 4.05 g. Draped bust of Diana r., with bow and quiver over shoulder; above head, bucranium. Rev. Togate figure standing r. over rock, holding aspergillum over bull; between them, lighted altar. Babelon Postumia 7. Sydenham 745. Crawford 372/1. NAC 54 (2010) lot 919. Why do they, as might be expected, nail up stags’ horns in all the other shrines of Diana, but in the shrine on the Aventine nail up horns of cattle? Is it because they remember the ancient occurrence?For the tale is told that among the Sabines in the herds of Antro Curiatius was born a heifer excelling all the others in appearance and size. When a certain soothsayer told him that the city of the man who should sacrifice that heifer to Diana on the Aventine was destined to become the mightiest city and to rule all Italy, the man came to Rome with intent to sacrifice his heifer. But a slave of his secretly told the prophecy to the king Servius, who told Cornelius the priest, and Cornelius gave instructions to Antro to bathe in the Tiber before the sacrifice; for this, said he, was the custom of those whose sacrifice was to be acceptable. Accordingly Antro went away and bathed, but Servius sacrificed the heifer to Diana before Antro could return, and nailed the horns to the shrine. This tale both Juba and Varro have recorded, except that Varro has not noted the name of Antro; and he says that the Sabine was cozened, not by Cornelius the priest, but by the keeper of the temple. It seems ripe for staging with far more characters and drama than another version. Also notice how much of the action happens off stage and the drama is the dialogue between characters, except the final sacrifice. It’s the trope of the cunning slave that really gets me me thinking in the direction of ancient theater. But all my searches have turned up nothing. I really wanted to put a footnote in and don’t really want to work up and defend the idea further myself. So I think its out of the book for now. Not the coin. Just the theater angle. n. 98 – Plut. QR 4 = Mor. 264CD; Juba FGrH 275 F12. Cf. Livy 1.45.3 with Ogilvie (1965) 183–4; Val. Max. 7.3.1; Vir. ill. 7.10–14; Zonar. 7.9. There was a prophecy that the outstanding heifer in Antro Curiatius’ herd would, when sacrificed in the temple of Diana on the Aventine, bestow on the city of the one who sacrificed it dominion over Italy, but Cornelius the priest told Curiatius to bathe before sacricifing, and then Servius sacrificed the animal and hung its horns (cornua, hence Cornelius) in the temple. For a coin with a bust of Diana on the obverse and a scene of sacrifice on the reverse, see RRC 372; the moneyer was A. Postumius Albinus, who was related to the annalist. Livy gives the story without the names, and it seems that only Juba had got the story in full, since Varro’s version is slightly different again. My basic line in the book is there is good evidence for an affinity between the gens Postumia and Diana from multiple moneyers. Unrelated gossip: I heard it on the Classics grapevine that T.P. Wiseman was the model for Albus Dumbledore as J.K. Rowlings, Professor at Exeter. Fun thought, even if not true. I will always associate Harry Potter with Numismatics as on 8 July 1999, the release date of the third book, I was attending the Institute For Classical Studies, University of London, Summer Schools in Numismatics, led by Meadows and Williams with Crawford and Burnett and co making guest appearances. One of my fellow students was a Glaswegian. I confessed to liking what was at the time a children’s book that had made the nightly news, not world phenomenon. He in turn bragged that he wording the cafe where Rowlings wrote the first two novels. Can’t remember his name. I loved children’s literature before Rowlings and enjoy it even more that her success means publishers give other authors longer word counts and cross market to adults more readily. Now, If only I had a longer word count for my book! One of my favorite activities when teaching Hellenistic warfare is to have students try to draw the siege engine that Polybius describes for the siege of Syracuse. The passage is below. I think its a useful way to build students ability to visual and engage with the text they are reading. Anyway. I’ve been wanting a Republican period image of a sambuca for many years to add to the lesson plan. And Lo! The musical instrument appears as control mark on the Papius series. I could get really obsessed with the Papius symbols. Must resist today. 4 1 Meanwhile Marcellus was attacking Achradina from the sea with sixty quinqueremes, each of which was full of men armed with bows, slings, and javelins, meant to repulse those fighting from the battlements. 2 He had also eight quinqueremes from which the oars had been removed, the starboard oars from some and the larboard ones from others. These were lashed together two and two, on their dismantled sides, and pulling with the oars on their outer sides they brought up to the wall the so‑called “sambucae.” 3 These engines are constructed as follows. 4 A ladder was made four feet broad and of a height equal to that of the wall when planted at the proper distance. Each side was furnished with a breastwork, and it was covered in by a screen at a considerable height. It was then laid flat upon those sides of the ships which were in contact and protruding a considerable distance beyond the prow. 5 At the top of the masts there are pulleys with ropes, and when they are about to use it, they attach the ropes to the top of the ladder, and men standing at the stern pull them by means of the pulleys, while others stand on the prow, and supporting the engine with props, assure its being safely raised. After this the towers on both the outer sides of the ships bring them close to shore, and they now endeavour to set the engine I have described up against the wall. 8 At the summit of the ladder there is a platform protected on three sides by wicker screens, on which four men mount and face the enemy resisting the efforts of those who from the battlements try to prevent the Sambuca from being set up against the wall. 9 As soon as they have set it up and are on a higher level than the wall, these men pull down the wicker screens on each side of the platform and mount the battlements or towers,10 while the rest follow them through theSambuca which is held firm by the ropes attached to both ships. 11 The construction was appropriately called a Sambuca, for when it is raised the shape of the ship and ladder together is just like the musical instrument. Yesterday I spent nearly the whole day worrying about M. Valerius Laevinus and his adventures of 215-210 BC. That is from when he was sent to the Adriatic to keep Philip occupied until his return to Rome to accept the consulship. It was a good day. I even reread an essay I wrote as a grad student in November 1998. I knew things then apparently that I no longer know. So strange. I rather like the me of sixteen years ago. Anyway. The reason is of course to figure out how the coins sit along side the narrative evidence. The two issues in question are RRC 100 and RRC 101. There is no doubt that Laevinus’ career resulted in the production of these coins. Reverse of RRC 100/3. ANS 1944.100.200. 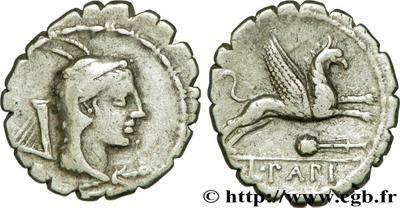 Drachm. Head of Aphrodite l., KOP monogram behind. Rv. Pegasos flying l. 2.40 grams. BMC 378. Ex Lockett Collection. Other specimens of Corcyra, here. Besides the map above, I also pulled together the literary sources on Laevinus’ exploits [links to PDF of translations]. “Die Heimath der letzteren ist ohne Frage Canusium, in deren Gegend noch jetzt vielfach Stücke dieser Art gefunden werden und auf welchen Ort, als am Gestade des Adriatischen Meeres gelegen”. “The home of the latter is without question Canusium in whose area pieces of this type are found even now in many cases and also at the site itself, as by the shores of the Adriatic Sea”. I’m hoping that the new valle dell’Orfanto project can provide confirmation of these early observations. I’m not surprised that the coins are found on the Adriatic or in SE Italy but I’d like more specific data before insisting that Canusium must be the mint rather than CA standing for, say, a magistrates’ name, such as we presume is represented by the ΓΑ on RRC 101. Canusium does not seem an obvious location with Laevinus’ sphere of action especially between the sack Oeniadae his recall to Rome. Also, we need to take the career of Laevinus into account when we consider the dating of the coins. Based on Livy 26.24 and 26 (see PDF above) it seems pretty clear that Oeniadae was captured late in 211 (after Zakynthos and near in time to Nasus). Winter 211/210 Laevinus is on Corcyra and spring 210 he attacks Anticyra before heading back to Rome. So winter 211/210 is the likely date it seems to me of not only the RRC 101 issue, but also RRC 100. At lastest spring 210 as Laevinus makes his way back to Rome. 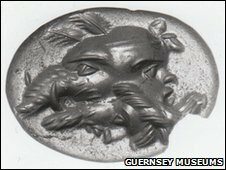 To accept Crawford’s date of 209-208 for RRC 100 we have to imagine that after the bronze coins were taken in Laevinus’ raid, they were kept on ice for between one and three years before being overstruck. The date of c.209 for this issue is perhaps influenced over much by the literary testimony that Marcellus engaged with Hannibal near Canusium in this year. But, Marcellus seems to have based for two winters at near by Venusia (a Latin colony, like Luceria), not Canusium itself. Hannibal seems to have at least some hope of convincing Canusium to come over to his side in 209. From p. 200 of Between Rome and Carthage by M. P. Fronda (CUP 2010). 297 out of 410 days: Acorns again. ANS specimens of RRC 21/7 = HN Italy 294. Click image for full details. Last time I was worrying about acorns, I was mostly on about RRC 14/7. This is the other ‘heavy’ acorn. Many of the specimens on the market do seem ‘heavy’ for being a 1/24th piece of a 265g as, or at least a quick scan suggests, but the ANS specimens are lighter: 11.75-13.9g. They are not so heavy that they seem particularly problematic in the weight standard, cf. the ANS uncia specimens of the series which are all much heavier. I’m also sure I’m being influenced by how RRC 14s and 18s are often found in hoards together on their own; another great publication surveying this phenomenon is online. Image links to online version of the publication. Okay, here’s one more complication. 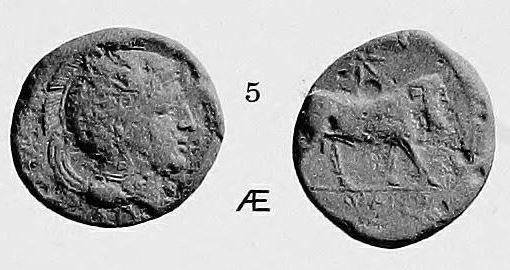 R. Russo in Numismatica Sottovoce proposed that RRC 16, 17, and 23 were single series (23 = double unit, 16 = unit, 17 = half unit) minted at Neapolis after the Battle of Beneventum. This seems too early to me and I hesitate to break RRC 23 away from it Messane mint connection. But neither of these points directly challenge them being a series. But if RRC 16 was really contemporary with RRC 17 that would detract from M. C. Molinari’s ordering of these three hoards as RRC 16 is present in Pietrabbondante… I find myself leaning more away from Russo’s idea of a series. Mattingly’s reading of the Pietrabbondante hoard is here but I think it’s mostly out of date given the evidence of the San Martino in Pentilis evidence. Note that the number of uncertain have been attributed to Neapolis above and the 126 of Neapolis have been missed out. I don’ t think it overly affects the interpretation of the hoard in source publication. The original publication of the hoard with all the details has been digitized, although it takes forever to load. 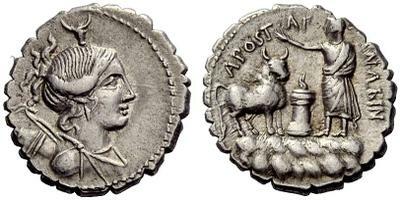 We have decided to share Rutter’s opinion who in Historia Numorum Italy attributes these coins to the Naples mint contrary to Crawford who assigns them to the mint of Metapontum. That said however, we have decided to refer to the coin as an obol and not as a litra as suggested by both Rutter and Crawford. The reasons for this decision are very simple: we obviously agree that this coin belongs to Crawford’s series 13, which was intended for trades with Magna Grecia. On this basis, it seems only logical that we refer to it as an obol and not a litra. 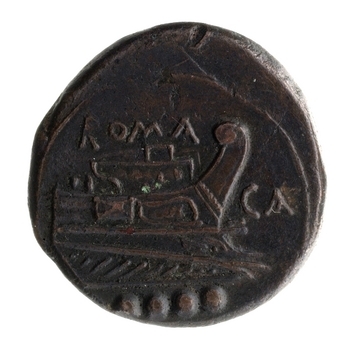 Its weight and its general appearance are consistent with coaeval obols of Camapianian mints such as: Fistelia, Peripoloi Pitanai and Allifae, which most probably were circulating along with this coin. JD collection of Roman Republican Coins. Obol, Neapolis 320-300, AR 0.66 g. Head of Mars r., wearing Corinthian helmet; behind, oak spray (?). Rev. Head of horse r.; behind, corn ear and before, ROMANO downwards. Fiorelli Annali 1846, p. 23 and pl. I, fig, 29. Garrucci pl. 77, 18. Bahrfeldt RN 1900, pp. 33-34, 31 and pl. 26, 1 (possibly this obverse die). Sydenham 2. Crawford 13/2. Historia Numorum Italy 267. There is only one of these coins known, but it comes with a good archaeological provenance. The original report is online here. And also here. PANVINI–ROSATI, FRANCO. Moneta unica di Norba. In: Archaeologia Classica, Vol. 11 (1959), pp. 102-107, pi. 40. On sacred context, but not the coin itself: S. Quilici Gigli, Norba: la topografia del sacro, in Ostraka 20, 2012, pp. 411-419. Vagi makes a very plausible explanation for the corn-ear with the horse head to allude to the Festival of the October Horse, a harvest festival in honor of Mars. Metapontum is a red herring for the Roman series, but what does Metapontum have to do with the Latin obols? 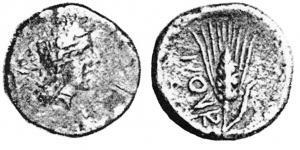 Why do we find her type borrowed on the coins of Norba? Also RRC 13/2 as an obol perhaps helps set a precedence that influenced the denominational choice for the Latin mints (Norba, Signia, and Alba Fucens) of the Pyrrhic War.